Still have a weeks holiday left so new blog posts will be scarce for another week. I have used the time off well so far on a homebrew project, more about that at a later date. I have written this before in a earlier blog but will say again..I'm a big fan of Classic or Vienna Lager as it is known in the rest of the world. If done right it is a simple tastier lager that you don't have to think about too much while drinking. Wafts of roasted malt, burnt toast and caramel from the pour. Classic pours a hazy dark amber with a creamy off-white to beige head. It has a moderately sweet intake with heavy roasted malt, caramel and hops in the background. The finish has a very light grassy and spicy bitterness. This has a short sweet and sour aftertaste with caramel and a bit of smokiness going on. Softly carbonated, the mouthfeel is light without being too watery. 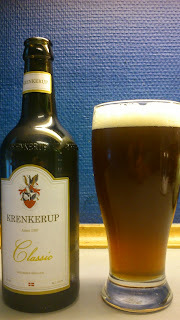 A very easy drinking, darker than usual vienna that hophead beer geeks would run a mile from. I do like the roast malts and the bit of smoke/burnt toast in this, it is almost a bit nutty. This reminds me a lot of the Fur Volcano Classic that I have blogged about previously. Coincidence being, that there is a host of made for supermarket 'craft' beers in the same price range. No problem for me with buying or drinking another as I have tasted this one a good few times now along with the Krenkerup Rauch, which is also quite good as an alternative to the heavier smoked beers from Germany. Summing up, a decent enough Vienna as an everyday beer. This scored 6/10 on the 'this means nothing to me...oh vienna' Beerometer. Where to buy CPH : Superbrugsen & Kvickly.